I need someone to explain this graph to me. What kind of music do you listen too? It looks like its going to sound like $hit and peaks high. 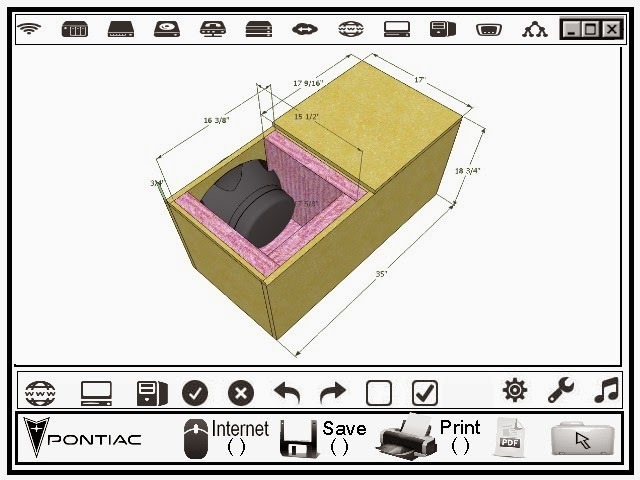 By looking at the T/S the sub will have a flatter response in a 4 cubic feet box with a port tune close to FS. It will also work in a sealed due to the QTS but I always recommend ported for the increased efficiency. I entered the TS parameters also and get similar results. This sub seems to be designed for lots of BOOMBOOMBOOM. How are you connecting it to your amp? it is 50watts x 4 into 4 ohms. You can bridge 2 channels and get maybe 150 to 300 watts into 2 ohms but it is not specified into 2 ohms. Perhaps a smaller sub in a smaller enclosure would have been better? Bigger is not always better! Music ranges from Dubstep to Country and anything that that has a good beat to it,thumping music mostly. THE SUBS ARE BASICALLY GETTING 150W ON EACH VOICE COIL from the same amp (not very correct to do but hey I utilize what I have). Until funds permit me to purchase a proper amp this 4 channel will have to do. The BOOMINESS is what I want, regardless. So, in simple terms, the graph should stay flat with no (or very little) peaks and roll-off gradually around the -3db line is what your saying. Now as for port size, Pyle recommends a 6 inch diameter x 9 inch long pvc port. Again, I apologize for seeming to be an idiot. Last edited by 87pontiac; 03-21-2014 at 05:20 PM. Ports are actually 4 inch diameter x 11 inch long. 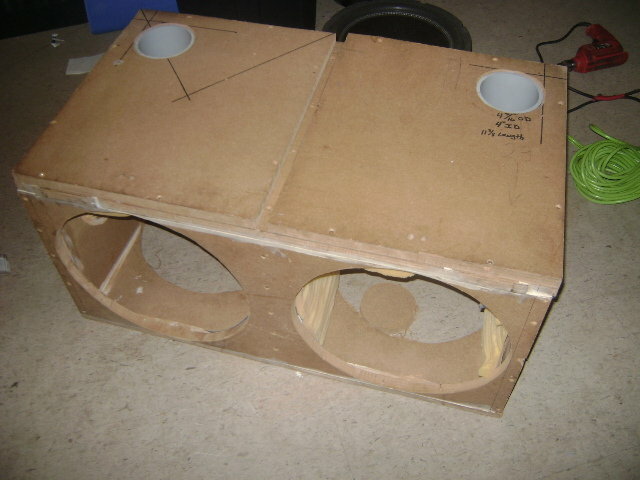 Harsh looking box, but rather use this for test fitting than ruining good box, once built. 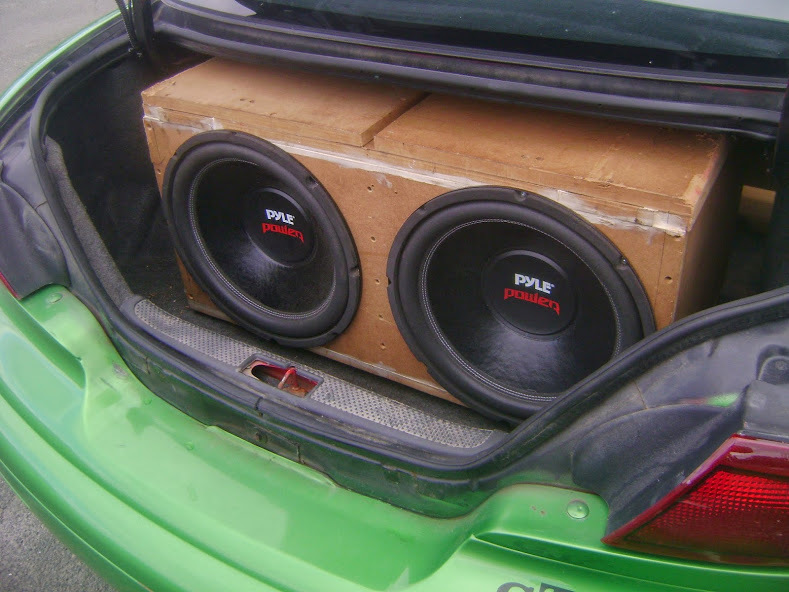 try port to the drivers side , and subs forward youll get a ton more bass ! 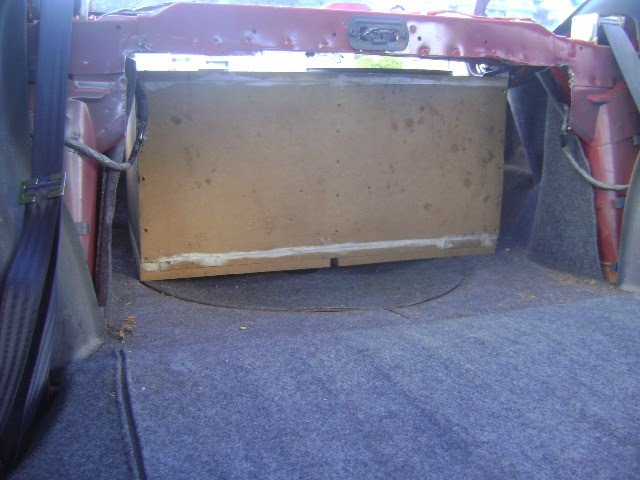 Well the plan is to put the subs toward the interior, seal off the trunk completely, with the ports firing inside the cabin as well. Now back to my original post, is it better to have a Flat,( 0db line), response that rolls off gradually at the -3db line. Im trying to get the boom or thump in the 80 to 114 hz range.